One of the things we loved to do as a family each December back home in New Zealand was to wander around the various streets that were entered in the Christmas light extravaganza competitions. In the Hutt Valley, there was the occasional street that did this well, but normally there were only very small pockets of houses that would go all out with Christmas lights. Sadly, in the last couple of years and as the financial down-turn hit families, the participation in these competitions have dwindled somewhat. 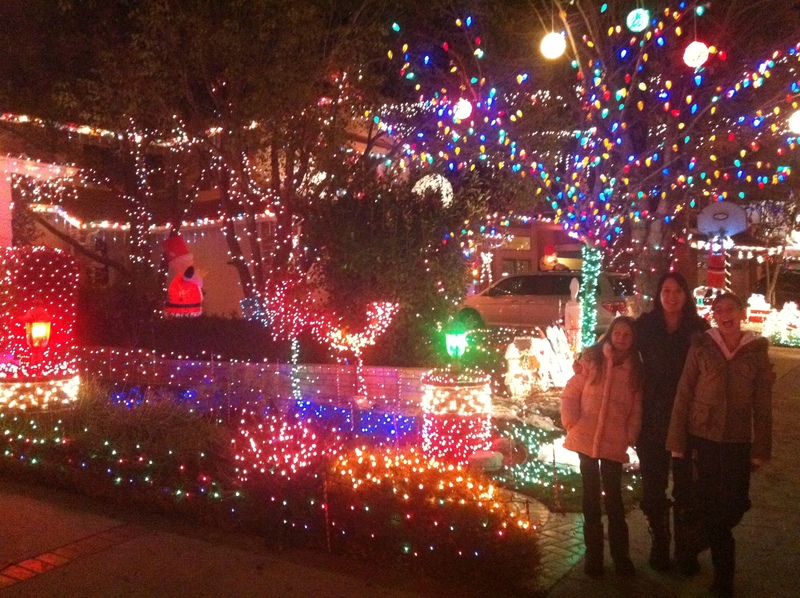 One of the things we were excited to see, was how the Americans would do Christmas lights on their houses. In movies and television shows, dressing up houses in Christmas lights was often portrayed as being a big thing, so we wondered if that was true or not. Last night was Family night, so after making the now traditional Friday night trek to Menchies, we headed off to neighboring Saugus to see a particular street there we had heard about – Wakefield Court. We knew we hit the right street because of the mass of cars trying to go down or park nearby. We weren’t quite ready for what we saw. It was magnificent. 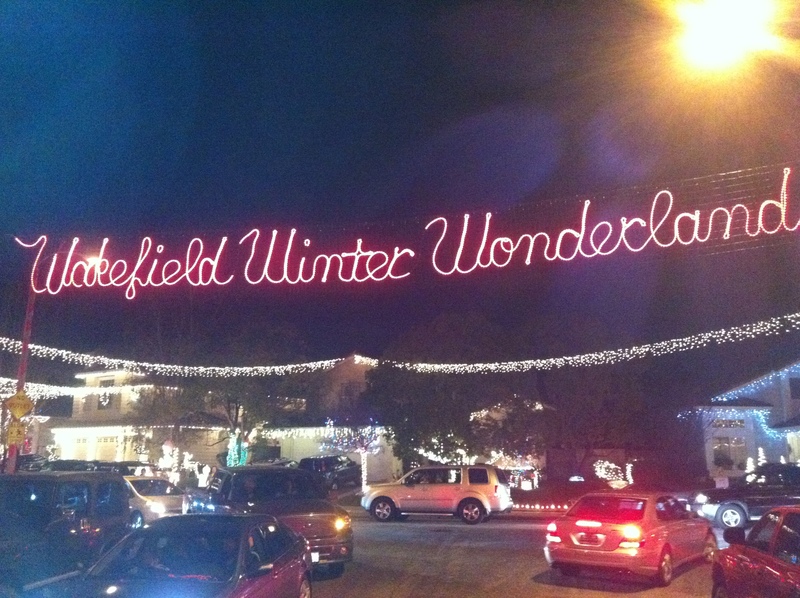 A huge Christmas light banner saying ‘Wakefield Winter Wonderland’ hung above the street entrance. 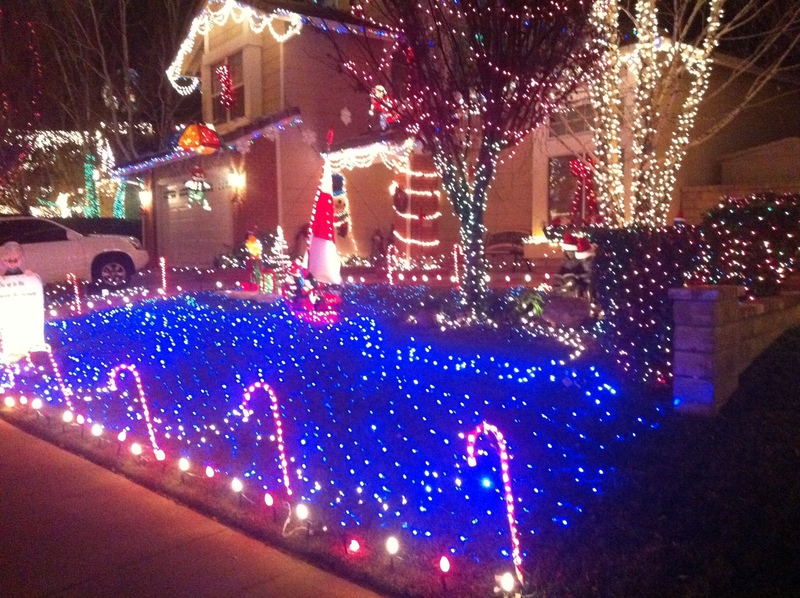 Almost every house was massively lit up and decorated. 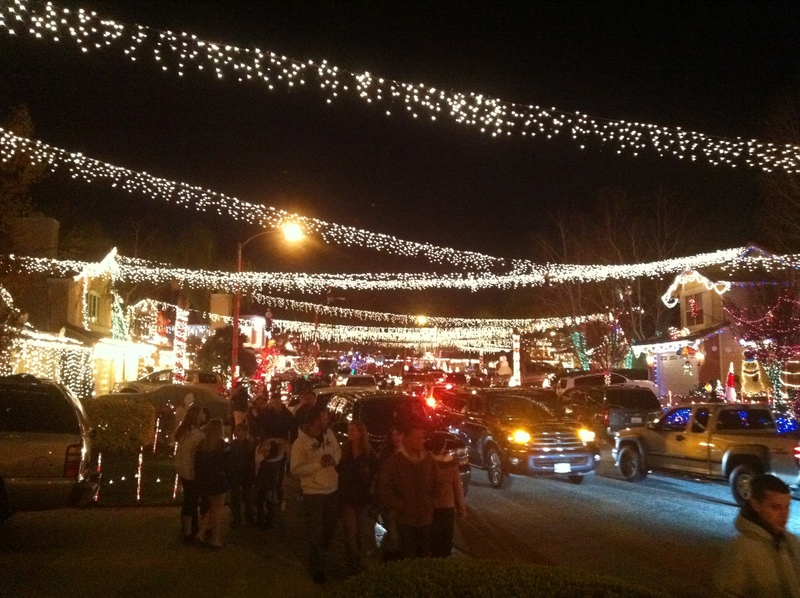 Christmas light chains were strung from house to house over the street. This was amazingly effective. There were residents in their driveways with their braziers lit, some of the residents were playing music (a couple with bands), giving out candy canes or just sitting outside enjoying the people coming through. All of these things created a real carnival atmosphere and we enjoyed it immensely. Picture do not do the event justice. You have to see it! borne out of disaster when the residents in the street had supported each other following the big earthquake of 1994. Wow! That’s awesome! We loved doing the same thing when we lived there. Enjoy, and merry Christmas to the family. Even the photos help me to only just begin to imagine what the lit up houses look like, but in real, it must be FANSTASTIC! Thanks 4 the shots. Wow huh! I can only imagine how it must have looked in the ‘flesh’. We can see it, but we can ‘feel’ it – if you get my drift?! The cars, all the people, the families, the music…. It’s great to see the Watson family doing stuff together. Good on ya guys. And thanks for sharing it with us. How much colder has it got? I was up at Manfeild yesterday – doing a track day on my motorcycle – and it was 27 degrees – very hot in my leathers & helmet. We’re having the Sunday School Celebration AND the Naenae for Christ Christmas meal (kai) this coming Sunday – it’s going to be ‘all hands to the pump’ that’s for sure. We’re missing all your great skills & inspiration. With the Lord’s help, I’m sure we’ll cope though (just)! We are praying for you guys for this weekend and for a successful event. If it is anything like last year, we are sure it will be fantastic.